As one of the four most common types of household mold, Aspergillus may take many forms. For most people, this type of mold is relatively harmless – unlike the allergenic mold known as Alternaria. However, for those who already have a weakened immune system, lung disease or respiratory condition, Aspergillus can pose serious health risks. Read on to learn important facts about this mold, including what you should do if you find it lurking in your home. Aspergillus is a genus that consists of several hundred mold species, while some being more dangerous than others. Found in various climates worldwide, Aspergillus is most commonly located in the Northern hemisphere during autumn and winter. This mold mostly grows on carbon-heavy substances in oxygen-rich environments, but it can also grow in damp places as a component of mildew. The mold you see on bread, potatoes, plants or trees is likely a species of Aspergillus mold. In your home, this mold can grow on damp walls, wallpaper, floorboards, carpets, HVAC insulations, filters, fans and more. What makes Aspergillus mold dangerous? 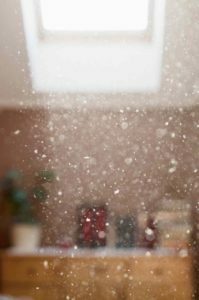 What do I do if I think mold is in my home? If you have any type of mold in your home, it’s best to contact the experts, such as the professionals at ServiceMaster of Columbia 573-443-8383. We will work with you to create a comprehensive mold remediation plan that is unique to your situation, so that your home and your health can get back to normal as quickly as possible. With our proven guidance and expertise, you may be able to prevent the risks associated with mold in your home, before they turn dangerous.